This bronze of a Grizzly Bear standing on his hind legs is taken from Charles Russell's well known sculpture titled "The Bluffers" which shows a Grizzly Bear confronting a Bison. Both are on the defensive and posed to attack or retreat as each animal shows its ferocity in a bluff before coming to an actual combat. The Grizzly Bear is a tough adversary as is the Bison, and Russell modeled them with his talent of capturing Western wildlife with an accurate eye. The original model was created in 1924 and a few were cast during the 1920s. 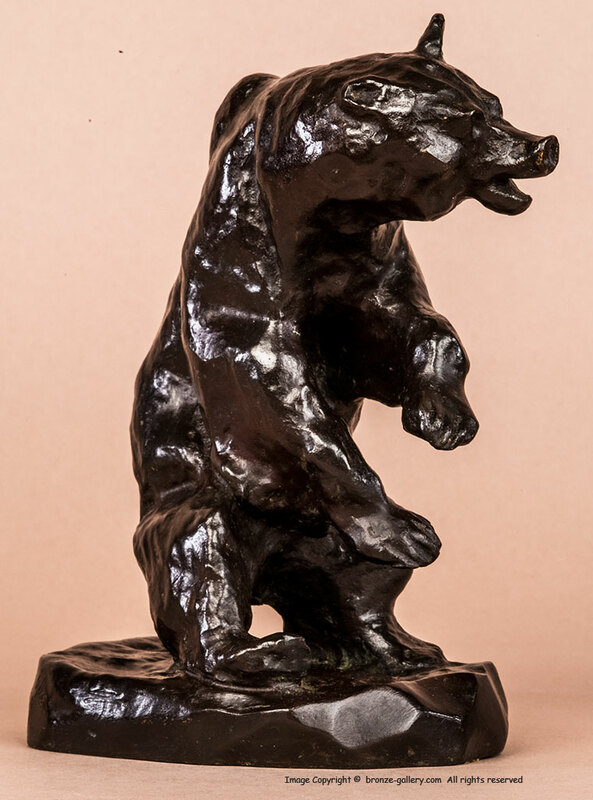 This bronze of just the Grizzly Bear alone was done later in a small edition of only 15 casts and this is cast number 6. The Montana Historical Society and the C.M. 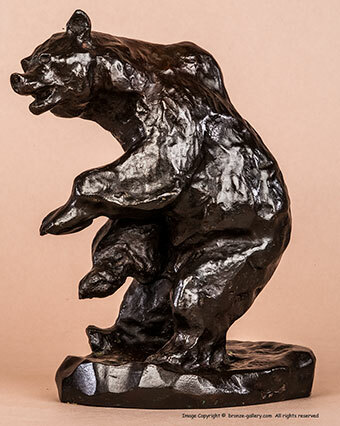 Russell Museum produced a few series of limited edition Russell bronzes in the 1950s and 1960s and this Grizzly Bear is most likely from one of those series. It is a good lost wax cast with a dark brown patina and it is signed on the base C M Russell with the cow skull and the cast number 6/15. A very nice Russell model that works well on its own of a Grizzly Bear which was one of Russell's favorite animals. This bronze is reasonably priced since it is an authorized reproduction done after Russell's death.